These are selling out fast! Hurry over because these popular Mermaid Tail Blankets in adult and child sizes are only $15.99 (Reg. $69.99+)! Several color options but some some have sold out! Let your little one feel like a mermaid while cozied up in this mermaid blanket. This blanket is made from premium-grade, double sided minky fabric with embellishments that will make any cutie feel like a goddess of the sea. 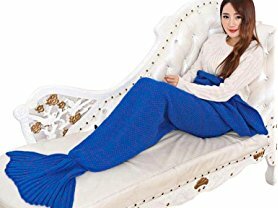 What appears to be a majestic mermaid tail is actually a soft knitted blanket that wraps the legs in a cozy layer of warmth. This soft, knitted Mermaid Tail Blanket is much more fun than an ordinary blanket. Use it on camping trips, long car rides, snuggling up with a good book or watching TV. It makes a great gift for the mermaid lover in your life. Care: Hand wash or machine wash gentle cycle inside lingerie bag; dry flat.